The renowned Karoo region of South Africa is divided into two regions, the Great and the Little Karoo. The Great Karoo is a semi-desert area totalling 400,000Km² and stretches from South Africa into Namibia. A large part of the Great Karoo stretches across the Northern Cape, the largest of South Africa's nine provinces and into the Southern Cape. Geologically vast, the inland basin is estimated to have been so, for the most part of the past 250 million years. Although westerners had settled in the Cape in 1652, it wasn't until the 1800's that some ventured north and into the arid region of the Karoo. It is believed that before this time, huge herds of zebra, antelope and various other large game roamed the region. Also, the Khoi and Bushmen, the last of the Southern African Stone Age peoples, wandered far and wide around this vast region. The Little Karoo, or locally known as The Klein Karoo (klein is Afrikaans for 'little') is the smaller and more southerly region bordered by the Swartberg in the north and Langeberg and Outeniqua Mountains in the south. The Klein Karoo is a more fertile region and is internationally famous for its Namaqualands spring bloom where the flowers blossom into an array of spectacular colours. Tourists flock to the area during this time to witness the miraculous awakening of the flowers. 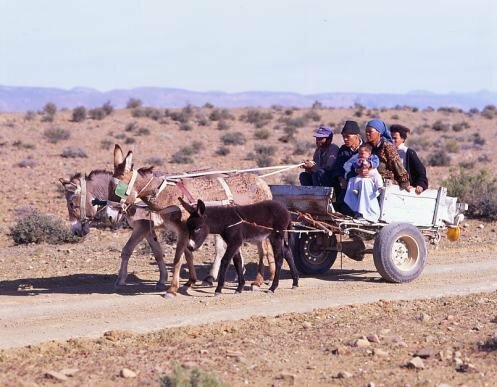 The Klein Karoo is also well known for its towns, each uniquely different and with its colourful peoples. Oudtshoorn is regarded as the main town and annually hosts one of South Africa's largest cultural events i.e. The Klein Karoo Kunste Fees (Arts Festival). The event is well attended and has become an extremely important event for South African Afrikaner culture and attracts top South African theatre, music and art individuals and acts. The event usually takes place around the Easter time. The Klein Karoo towns include Beaufort West, Calitzdorp, De Rust, Prince Albert and more. The 1600Km trip from Gauteng in the north via Bloemfontein to the Cape along the N1 highway is a road much traveled by many South Africans seeking a vacation break at the lush coastal regions of the Cape. Various routes can be taken to the Cape region, each route with its own gems to discover. The stark contrast between big city life and the huge farms of the Karoo with its colourful small towns, interesting people, guest farms, hotels each with its own South African cuisine are the components that make great and unforgettable holiday memories. The borders of the Klein Karoo are not clearly defined and generally, Barrydale and Uniondale are considered the southern and eastern boundaries. Two main routes lead south from Oudtshoorn into the Southern Cape and the Garden Route. The N12 route leads to George via the fantastic Outeniqua Pass and the R328 leads to Mossel Bay via the Robinson Pass. 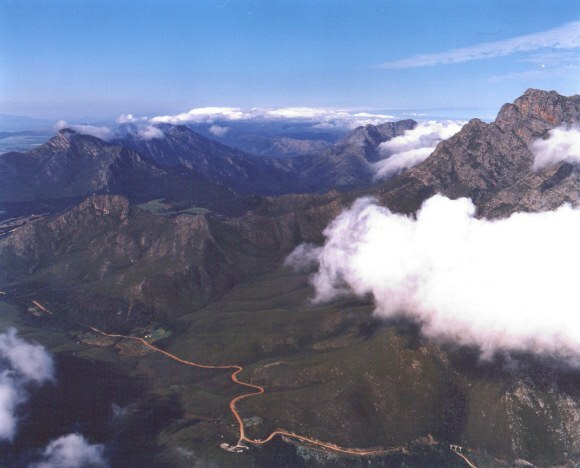 The Outeniqua Pass was located by P.A. de Villiers, the then National Road Board's location engineer, who is commonly regarded as one of the great road builders of Southern Africa. Construction started in 1943 and opened in September 1951. The 800m Outeniqua Pass ranks as one of the world's most scenic road passes and is an absolute pleasure to use. The summit is reached after just 14Km travelling from George and several view points along the route allowing spectacular views of the city of George and the majestic Outeniqua Mountains. 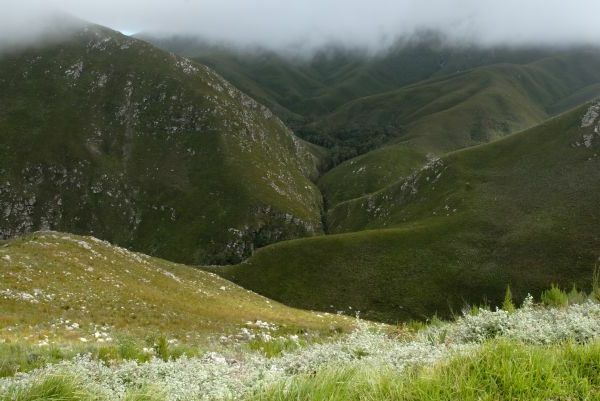 Before the Outeniqua Pass was constructed, the Montagu Pass was the only route between George and Oudtshoorn and today still exists, however is more an historical and tourist attraction, rather than for actual traveling. The Montagu Pass is today a popular scenic drive as well as a hiking and cycling route through the picturesque Outeniqua Mountains. About 250 convicts tackled the arduous task of building the new road. They were housed in two camps, the South station and the North Station. The job was completed at a cost of R71 598-00. In December 1847 the pass was opened for traffic, but the official opening only took place on 19 January 1948. This was a festive affair, and the Hon. John Montagu personally opened the pass which was to be called after him. The passage over the mountains, which by ox-wagon, used to take a full three days over the tortuous Cradock Pass, could now be accomplished within three hours (Today it hardly takes 15 minutes by car). The R328 from Oudtshoorn to Mossel Bay winds through a different part of the Outeniqua Mountain and the longer winding route via farms and small villages offers some majestic views of the Ruiterbos Valley region and good opportunity to stop along the roadside for refreshments. Nestled in the Ruiterbos Valley region, lies the unique 80 year old Eight Bells Mountain Inn, which is a stopover not to be missed. 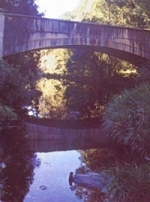 The Ruiterbos Valley region is today considered a destination in its own right and there is much to be seen along R328. The region is well known for the San people, who lived in this region and their rock paintings remain. The Ruiterbos Valley is a farming community and many of the farms date back to the 1820 settlers and have a strong family history. The R328 from Oudtshoorn to Mossel Bay is certainly a deviation from the route most taken and will prove to be surprisingly pleasant.